cubatravel has been a member since February 27th 2014, and has created 13 posts from scratch. What few people recognize is that when Christopher Columbus pronounced the now famous “the most beautiful land human eyes have ever seen” It was when he got his first glimpse of the Holguin coastline in 1492. As a beach destination, Holguin’s pristine sands and azure waters of Guardalavaca. Located approximately 50 kilometers from the city of Holguin, Guardalavaca offers visitors a stunning beach setting along a 1,200 meter long bank of the Cuban seashore. Spectacular beaches can also be found at the enclaves of Playa Esmeralda and Playa Pesquero, the latter having Cuba’s largest hotel all to itself. But Holguin is not just about beaches. The province is considered to be one of the most significant burial grounds in the Caribbean region; known as the “Chorro de Maita” there’s a site of a village and a burial ground of Arawak Indians dating back to 1490-1540. Excavations at this site have uncovered 108 remains, including the skeleton of a European. Your stay in Holguin won’t be complete without a visit to the nearby Dolphin Aquarium in Guardalavaca. At the dolphinarium visitors will have a chance to see some of the most loved mammals in the world perform and learn about their habits in a natural environment. Swimming with the dolphins is also an option at the Aquarium. Pristine reefs and abundant marine life ensure excellent diving and snorkeling in the warm, clear shallows of the Atlantic. Farther inland, rolling hills and rugged mountains provide a stunning landscape just pleading to be explored. Legend states that the coastal area of Holguin was a favorite place for pirates and buccaneers due to the isolation and low population. In fact, the name of Holguin’s famous beach, Guardalavaca, means “put the cow away”, said to be from the settlers hiding their cattle when they saw the raiding vessels approach the shore. Rumors speak of hidden treasures buried along the coastline of the Holguin province waiting to be dug out from under the sands. The resort area of Guardalavaca offers visitors a secluded tropical setting and has quickly grown to be the second largest tourist destination in Cuba. The clean, warm waters of the Atlantic Ocean are calm and offer great conditions for water sports. Guardalavaca is an ideal place for those who want to get away from it all. If you are into contemporary history, in the town if Birán, you can visit the farm where Fidel and Raúl Castro grew up; or view the only known gold figurine created by Cuban aboriginals at the Archaeological Museum in Banes. The seaside town Gibara, once the main port on the northeastern coast of Cuba, is a quaintly charming slice of the Spanish Mediterranean. Holguin is a province of contrast, offering interesting things to see and do for both young and old. Tags: Banes Holguin, Chorro de Maita Holguin, Christopher Columbus Holguin, City Center Holguin, Guardalavaca Holguin, Holguin Beaches, Holguin Cuba Guide, Holguin Museums, Holguin Tourism, Holguin Vacation, Official Guide Holguin Cuba, Swim with Dolphins Holguin, Where is Holguin? Experience the natural beauty of Holguin, Cuba with a stay at the charming Hotel Don Lino. Located in the town of Santa Lucia, only 30 minutes from Guardalavaca, the Hotel Don Lino provides villa type accommodation in Brazilian styled cottages surrounded by tropical coconut palms and beautiful caleta grape vines. Guests will enjoy the private white sand beach and the tranquil atmosphere, perfect for a relaxing beach vacation. If you’re looking for a unique and rustic vacation in paradise, make the Hotel Don Lino your home when visiting Holguin. Our booking process is unique because it shows the best rate from all of these for Villa Don Lino hotel in Holguin and the types of rooms available. Our Villa Don Lino Holguin rate comparison is an industry first for Cuban Hotels. Once you’ve compared the rates, finalizing the booking at Villa Don Lino Hotel takes just seconds and an immediate confirmation is provided in real-time. 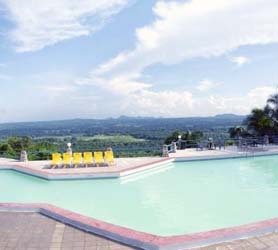 Hotel Pernik in Holguin has a 3 star rating and is located right in the center of Holguin city. Hotel Pernik is a popular hotel frequented by diplomats, artists, writers and heads of state; it has the a perfect central location and comfortable atmosphere, and its staff are both kind and offer professional service. Our booking process is unique because it shows the best rate from all of these for Pernik hotel in Holguin and the types of rooms available. Our Pernik Holguin rate comparison is an industry first for Cuban Hotels. Once you’ve compared the rates, finalizing the booking at Pernik Hotel takes just seconds and an immediate confirmation is provided in real-time.